Freshly made donuts are a real treat. These cake donuts take less time than yeast donuts because there is no rising time involved. If your not a fan of drowning them in cinnamon sugar try powdered sugar or a little sprinkling of vanilla sugar. Whenever I use a vanilla bean, I throw the pod in a glass jar with some sugar, shake it up and the vanilla bean will begin to flavor the sugar. These donuts are best enjoyed the day you make them, but will also be great the next morning with a cup a coffee. Mix dry ingredients in one bowl. Combine wet ingredients in another bowl with seeds from vanilla bean if using. Add wet ingredients to dry and combine. Mix ingredients until a dough starts to form. Place dough on floured board and kneed dough slightly. If necessary add a little flour to bring dough together. Be sure not to overwork. Flatten dough to about 1/2 inch thickness. 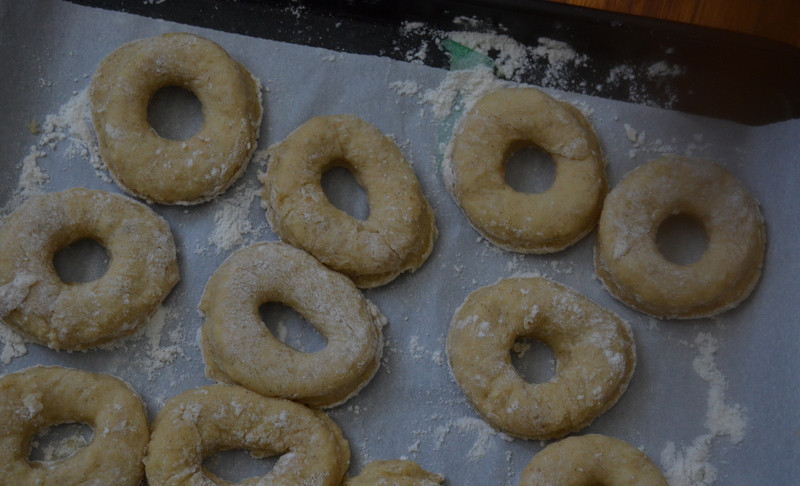 Using a floured cutter, cut donuts in desired size and place on a parchment lined cookie sheet. After cutting first round of donuts. Combine dough a second time and flatten to cut a second batch. After all donuts are cut place in fridge while you prepare the oil and sugar coating. I fried the donuts in a medium sized pot with about 2 inches of oil. You can also use the deep fryer. You want the oil to be around 365. I do not use a thermometer, but I test one donut to check the oil temperature. If the oil is too hot, the donut will cook quickly on the outside and the inside will not fully cook. You want the donuts to cook about 1-2 minutes per side and be a nice golden brown. When frying the donuts be sure not to crowd the pot or fryer. After removing donuts from oil, drain on a paper towel. When you have completed frying the donuts, roll in cinnamon sugar mixture and enjoy.